Mechanization increases the power applied to agricultural operations and is one tool among many for improving farm productivity. It alone cannot drive the transformation of agriculture. Farmers will mechanize to lower costs and ensure timeliness of operations, allowing a greater area of land to be cultivated. The demand for mechanization is therefore determined by the stage of agricultural transformation reflecting the use of complementary inputs (improved seeds, fertilizer), the intensity of farming, land holdings, and rural labor supply. 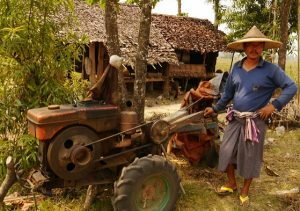 Countries across developing Asia have mechanized at different rates corresponding to their level of agricultural transformation but also strongly influenced by government policies. ReSAKSS-Asia organized a knowledge exchange event entitled “Agriculture and Rural Transformation in Asia: Past Experiences and Future Opportunities” to discuss, among many topics, insights into how agricultural mechanization has evolved in countries with different agro-ecological, institutional and political settings, and what common lessons can be learned for those countries at the early stage of mechanization. This brief summarizes some of the key lessons shared by participants.